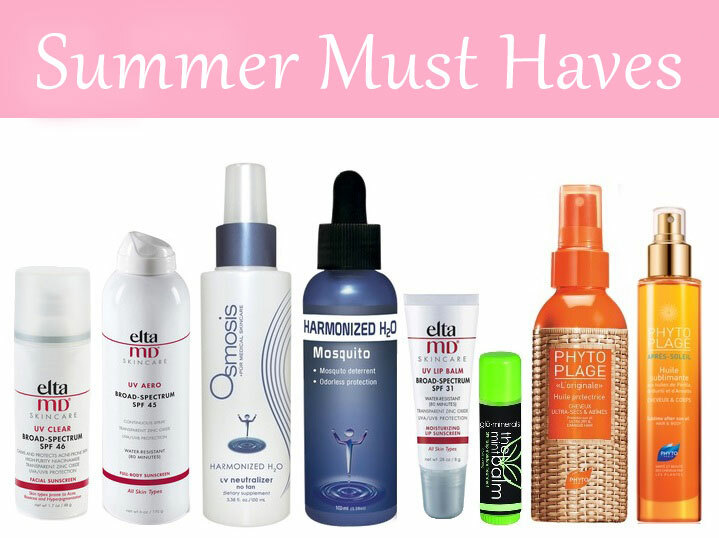 As we make our way through the first week of summer (officially), I wanted to share my favorite summer essential products with y’all. Being from central Texas, summer is sometimes the only season we can actually count on to happen in a year, so it’s safe to say I have my summer beauty regimen down. Read on for a list of essential summer-time products! It doesn’t matter if you have scorching hot summers like us in Texas, or if you barely have a summer season at all. Regardless, the sun is out longer each day and slowly but surely causing damage to your skin. It is so important to find a good daily sunscreen to prevent any future, or further, sun damage to your skin. We have a variety of amazing sun care products to fit each and every skin type or condition. We have them tinted, we have them for oily/dry/sensitive skin, and we even have them DRINKABLE. Yes, drinkable. I have listed my favorite three below, but you can view a list of all of our sun care products here. EltaMD UV Clear Broad-Spectrum SPF 46: There is a sheer or tinted version of this facial sunscreen. It is non-comedogenic, and great for all skin types. EltaMD UV Aero Broad-Spectrum SPF 45: This is a full-body, water resistant sunscreen spray. Perfect for spraying the kids on a hot summer pool or beach day. Osmosis Harmonized H2O UV Neutralizer: Yes, this is the drinkable sunscreen. This is actually water that's harmonized at specific frequencies to deter the UV Rays, so you won’t actually be drinking sunscreen. Available in No Tan, and Tan Enhancing versions. Perfect for throwing in your purse or backpack while on the go and last for about 3 hours of being in the sun before you will need another dose. Speaking of the harmonized H2O water for sunscreen listed above, I have to recommend the Harmonized Mosquito Water as well. Here in Texas, with all of the rain and flooding we had the past several months you already know the mosquitos are BAD, and only going to get worse over the summer. Protect yourself, and your children or pets, with a simple, mess-free, scent-free, and hassle-free mosquito harmonized water. I use this for myself and my 4 year old and as long as you take it as directed, it actually works. Something you may not even consider is protecting your lips from the sun as well. Swap your lip gloss for a chap stick (at least underneath the color) to keep your lips soft and hydrated during this season. I have listed my favorites that contain a bit of sunscreen perfect for summer. EltaMD UV Lip Balm Broad-Spectrum SPF 31: This chap stick is broad-spectrum, water-resistant, and long lasting. Super inexpensive so worth buying a few to keep in your pool bag or car for on the go! gloMinerals The Mint Balm: Provides a SPF of 15, with a rosemary and mint scent that is so refreshing! This is much larger than your typical chap stick and will last you forever. It’s also available in a cherry version. Have you ever even considered that the UV rays from the sun could be damaging your hair? It makes sense right? Thankfully we have a product that actually protects the hair from the sun, salt water and pool water. This will keep your summer hair from being damaged by the effects of our favorite summer activities, as well as help preserve your color if your hair is dyed. We even carry a product perfect for all over the body, and hair, after a long day in the sun. This hair and body oil is a necessity for any and every one this summer. It’s a lightweight oil that can be applied all over from head to toe. The scent is refreshing, yet subtle, and the oil will not leave you feeling greasy once applied. Also it actually helps enhance your tan for 6-8 hours after being in the sun. 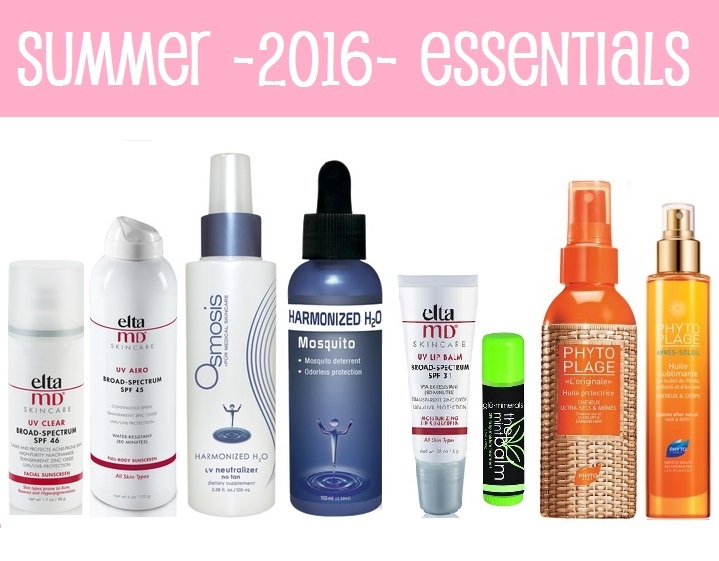 Do you have your own Summer Essentials routine you follow? I’d love to hear them in the comments below! If you’re interested in any of these Summer Essentials products, use code SUMMER16 for 15% off* of these products through July 22nd. Don’t forget to protect your skin, stay hydrated, and stay beautiful this summer! *Please note, some brands are excluded from promotional offers. Please view our Brand Exclusions page for details. Complete the Look with Lip Color!